I love all kinds of crafts and DIY projects. One of the things I really like is making beauty products. 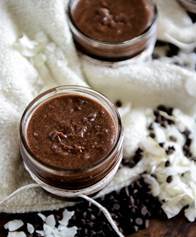 I recently found this great recipe for Chocolate Coconut Sugar Hand Scrub from Celebrity Manicurist and Owner of As U Wish Nail Salon, Skyy Hadley. This sweet and tasty scrub is perfect to revive dry hands and feet! The cocoa in this scrub is rich in antioxidants which are very beneficial to your skin. Skin is very absorbent and will draw the antioxidants from the cocoa, helping to battle free radical damage that makes it look dehydrated and dull. I even have all the ingredients at home now. I think I will make some tonight! Add all ingredients together in a large bowl and mix until combined. Make sure to mix enough so there are no chunks remaining. To use the scrub, simply rub it all over your hands and feet and let sit for about 5 minutes. Rinse it off using warm water. Make sure to follow up with a hydrating moisturizer such as Josie Maran’s Whipped Argan Oil Intensive Hand Cream! As I have talked about before I love products that have Argan Oil in them. I bet this would really make your hands soft. The scent sounds great too – Vanilla Apricot! Also always apply a cuticle oil to keep nails looking fresh. I like to use Lauren B.’s Nail and Cuticle Balm because it’s so easy to use and doesn’t leave my nails oily! I really need to use this product. I really do not take very good care of my hands or nails. This weekend – make sure you do something special for yourself. I am going to give my hands and feet the attention they need by using the Chocolate Coconut Sugar Hand Scrub! 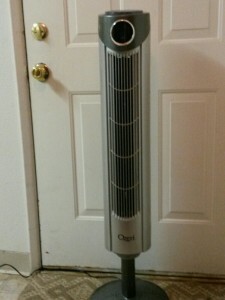 I have tried a few products from Ozeri and they have all been great products so I was excited to try the Ozeri Ultra 42″ Wind Fan. When the Ultra 42″ Wind Fan arrived Rex assembled it with no problem, no tools needed. It has a nice sleek design and doesn’t take up much room. It arrived later in the year so we have not had much opportunity to use it but I can see it will get a lot of use this summer. We have used it a bit and for it slim size it has a lot of power and works very good! One of the features is that it has 3 airflow patterns that designed to foster sleep, relaxation and comfort. I like to have a fan on in the bedroom at night – but in the past Rex said the noise has bothered him. The Ultra 42″ Wind Fan has 3 whisper-quiet speed settings and you can hardly hear it. So I will be able to use it in the bedroom this summer with out disturbing our sleep. Another nice feature is the 12 hour timer that can be programmed lots of different ways even in 1 hour increments. The best part is that the timer is easy to set up! I also like that it has a remote control and when not in use, the romote stores in the top of the fan. The fan also displays the rooms temperature on its multi-colored LED screen- which will dim when on the night mode. The Ozeri Ultra 42″ Wind Fan has a 90 degree oscillation – so the whole room can get the benefit of the cool air. Even when oscillating there is little noise. With it being tall when it oscillates the breeze hits your body not just your head or feet. The Ultra 42″ Wind Fan will give us many hours of cool comfort. If you would like to purchase your own Ozeri Ultra 42″ Wind Fan you can do so on the link below from Amazon.com. Why do people go on vacation? We spend a lot of time planning and saving up in order to enjoy a week or two every year of sunshine in an unfamiliar setting. There isn’t anything quite like living it up in another country, is there? The opportunity to explore and experience new cultures is one of the best things we can do. And while being on holiday is usually a lot of fun, the lead up can be quite challenging. 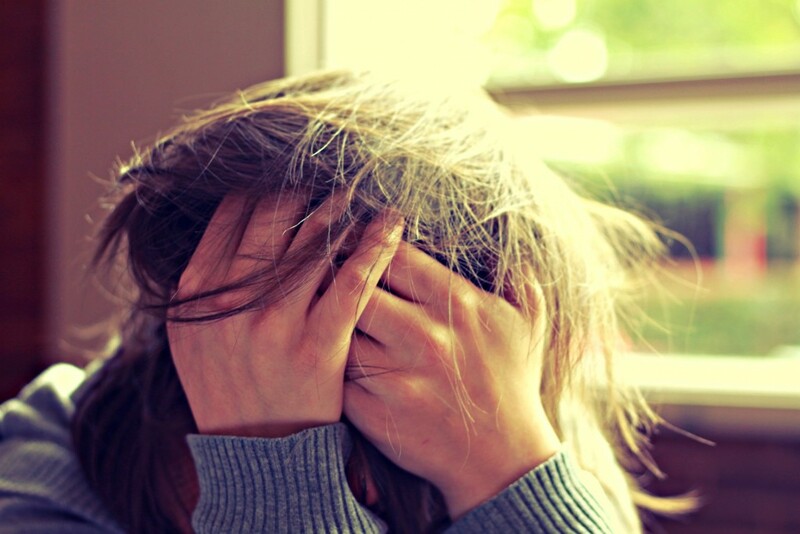 Especially on the big day, when all our plans seem to collide in one big mess that leaves us stressed and anxious. Well, given that holidays should be all about relaxation, here are a couple of things you can do on the day you travel to take some of that stress out of the equation. How many people are guilty of leaving their packing until the very last minute? Raise your hands. I’m one of those people, too. I guess it’s just human nature to leave things until the last possible second before we have to attend to it. However, this creates a bunch of unnecessary stress. You’re bound to run into problems with this method. You won’t be able to find everything you need. You’ll find that your swimsuit doesn’t fit anymore. Or, worse still, you can’t seem to find your passport! Why put yourself through all of that? Get packing done well in advance so you can alleviate some of that vacation day stress. This is a tricky one, for a myriad of reasons. While there is no shortage of options, they all come with their own list of pros and cons. You could always drive to the airport, but that involves paying a premium for airport parking. And we all know how expensive that can be, right? Forget that. How about taking a taxi cab? It’s a viable option, for sure, but it’s still not cheap. Better still, how about a car rental? It’s far cheaper than you might think, and you can find Hotwire car deals online. You’ll be surprised by how easily accessible it can be. This is where a lot of people start to lose their minds. All of that waiting around and with nothing much to do, it’s no wonder you might start to get restless. Instead, even if you find your flight has been delayed, try not to worry too much about it. Spend your time wisely and you can stave off boredom. Hit up the airport bar, do a little bit of shopping, or have some lunch. Whatever you need to do to pass the time. Another area where boredom can take a hold is on the flight. Minutes seem to pass by like hours, and there’s no let-up. The flight seems to take forever and you’re losing your mind! It’s imperative that you take a bunch of things to keep you occupied. Whether that’s loading up your tablet with movies, listening to music, or even just getting some sleep. Staying occupied will make the time pass by much more quickly. Accessories add a wonderful appeal to the clothes you wear by giving your look a subtle flair that is both distinguishing and creative. Yet in many cases, people fall into the pattern of using the same old jewelry, shoes, and purses. Break out of this cycle now by updating your accessories. Companies like Tribal Muse offer unique Tibetan jewelry that can spice up your wardrobe. If you’re serious about optimizing your appearance, you need to carefully examine your diet. In the U.S., the majority of citizens eat a Standard American Diet (SAD) that is not conducive to health or beauty. This diet lacks the nutrition and fiber necessary to promote optimal physiological function, thereby impeding important processes like cellular renewal which contribute to glowing skin. Luckily, there are several simple dietary changes you can make to ensure that your body functions optimally and provides you with the glow you want. One great way to get started is by developing a juicing habit. By drinking just one fresh fruit and vegetable juice each day, you can do wonders for your skin. 3. Let The Professionals Assist You. In many cases, people try to work out their beauty routine on their own. Yet unless you have extensive education and experience in cosmetology, this is not an optimal route to take. You don’t have to live in the beauty parlor to look your best, but allowing professionals to assist you with things like haircuts and facials is a good idea. These beauty treatments keep your look fresh and appealing, and they also give you the opportunity to experiment with new products that could work more effectively than what you’re already using. Don’t Delay: Get More Gorgeous Today! If you’re ready to update and optimize your look, there’s no time like the present to get started. Embrace beauty and deeper, more authentic self-esteem by utilizing the techniques and tips offered above! You should see my hair when I get up in the morning ~ I must toss and turn all night! I have long curly hair and I put it back in a pony tail when I go to bed, but it still gets full of tangles and snarls. I use to dread combing out my hair in the morning. I have tried products that say they get snarls out – but they don’t seem to work. That is why I wanted to try this Detangling Brush from Miss Landson. The first thing that surprised me was how light the brush was and how flexible the bristles were. The brush works great! It doesn’t pull and does help get the knots out of my hair. I have been using it in the morning to comb out my hair before I shower and then afterwards so on both wet and dry hair. I love it! I wish I would have had it as a kid. It really does work and I haven’t noticed a lot of breakage and hair loss like I do with a wide tooth comb or other brushes I have tried. If you have a daughter that hates having you brush or comb her hair this would be a great brush to have. They would probably even brush their own hair. 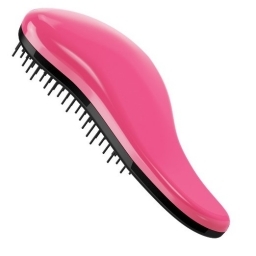 If you would like to purchase your own Detangling Brush you can find it on the link below. Abdominal Pain: What Does It Mean? At some point in your life, you will probably experience abdominal pain. Most causes of this type of pain are not serious and can be diagnosed and treated without concern. It’s important to know when your abdominal pain is a symptom of more serious illness and when to see your doctor. If your abdominal pain is severe, recurring, or accompanied by any of the following symptoms, you should contact your doctor as soon as possible for diagnosis and treatment. These symptoms may be an indication of an internal problem. If you vomit blood, have black or bloody stools, difficulty breathing, or abdominal pain during pregnancy, you should seek immediate medical attention right away. Diagnosing abdominal pain can be difficult since there are so many potential causes. Pain can range from mild to severe and last for a few hours or a few days. Mild pain is uncomfortable, but severe pain can disrupt your daily routine, so it’s best to see your doctor for an accurate diagnosis. Your doctor will want to do a physical exam that may include urine and stool tests, blood tests, enemas, and an endoscopy. During the exam, your doctor will also ask you questions about your symptoms, and possibly schedule x-rays with digital x-ray imaging to see what’s going on in your abdomen. The treatment for your abdominal pain will depend on the cause. Treatments can range from changes in diet for pain caused by certain foods or beverages to medications for inflammation and infection, ulcers or GERD. If your abdominal pain is caused by a hernia or appendicitis, your doctor may recommend surgery. I have long curly hair and love to try new products to help make it look healthy and soft. Party Curl Cocktail by Royal Locks #royallockshaircare is the newest product I have tried. It contains Moroccan Argan Oil which is used in a lot in beauty products and has been used for thousands of years. This is a spray it goes on lite and has a nice scent. I really like using this Party Curl Cocktail it makes my hair look soft and really helps makes my hair look healthy. My curls are more defined and they don’t look frizzy. Some days my hair looks so dry and unmanageable that I want to cover my hair. Now I just spray it with Party Curl Cocktail and it looks great. I spray it in the morning and it still looks good when I come home from work. It also washes out easily – and doesn’t build up like some products do. This is something I will be adding to my beauty supplies from now on. 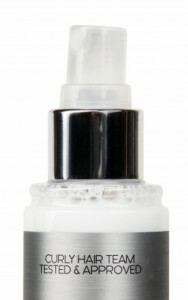 If you would like to try Party Curl Cocktail you can find it on the link below from Amazon.com. First I want to tell you about the Skin Detoxifying Clay Mask . Clay mask are used to help gently remove excess oil and dirt. Valentia uses a natural kaolin clay and botanical based mask. Along with deeply cleaning your skin clay helps improve your skin tone and make you look younger. The clay mask mixture also included aloe vera to help moistures your skin, hibiscus & cranberry fibers to help firm and reinforce your skin, green and white tea to help fight aging and there are many more natural ingredients in the skin detoxifying clay mask that all work together to clean your skin and help you look younger. The mask was very easy to use. You just apply generously to the face – avoiding the eye area. Leave on for about 20 minutes or until it dries. Then use a damp cloth to remove. I loved the way my skin felt after I used the mask. It was soft and felt really clean. I was happy that it didn’t get all dried out. 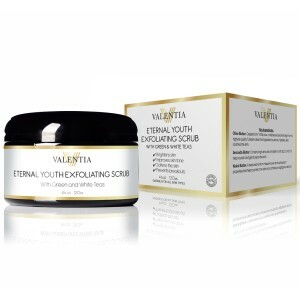 The second product was the Eternal Youth Exfoliating Scrub and I really like this product. This contains green and white tea along with 3 tropical butters. I loved how you feel a slight tingle as you use it. The scrub itself is thick, you can tell how good it is for your skin. It too will help your skin look younger and feel great! It is easy to use and I use it a few times a week in the shower. You just take a small amount and with circular motion on face for gentle exfoliation. Then rinse off and your skin will look fresh and vibrant. You can find both products on Amazon.com. I like both products and would use them again and again. I love products that make my life easier. 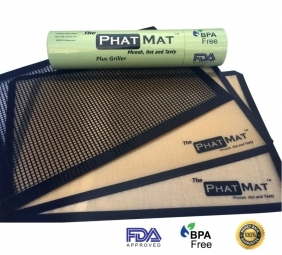 I recently started using The PhatMat #ThePhatMat. It is a food safe silicone mat that I put on cookie sheets so that your food doesn’t stick. Not only is it great from keeping food from sticking it makes clean up a breeze. Just wash it in soapy hot water or in the dishwasher. It lies flat or rolls up to store. I found I love using the PhatMat for baking cookies. The cookies just slide of the tray when using the mats. I also like it for reheating pizza – the cheese doesn’t get stuck on the pan in a hard blob – but easily comes off the PhatMat. You can also use the mat for rolling out dough. No more spending money on parchment paper, wax paper or sprays! Along with 2 THE PhatMats I received a mat for the grill. It is great to use on the grill to help keep things from falling through the grates like veggies or fish. Also keeps your grill much easier to clean. The design is open mesh so the smoke still comes up and flavors your food. It is easy to clean too just wash in hot soapy water or the dishwasher. Two great products that I use a lot. If you would like to purchase your own set of PhatMat use the link below from Amazon.com. One of my favorite accessories to wear are bracelets and handcrafted items. I recently found a place to find some exquisite jewelry; it is LESEBI. They have many handcrafted pieces made by artisan from around the world. 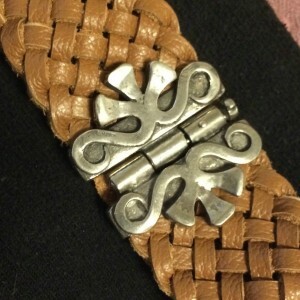 The piece above is a Horseshoe Carval Bracelet. It has a beautiful Fleur De Lis is the center piece that is made out of pewter – the latch slides out of the middle and is a horse shoe nail. The strap is made from hand cut leather strips which are braided together. I love the look of this bracelet by itself or with another bracelet or watch. Every time I wear my Horseshoe Carval Bracelet it always catches someones eye. I think what I like best is that it elegant yet simple. The bracelet is also very durable and should last me along time. The Horseshoe Carval Bracelet was created by an artisan in Argentina. LESEBI chooses pieces for their collections because of the one of kind artisan techniques and rarity. LESEBI has many beautiful bracelets, rings and necklaces. Each piece has details that show a special talent. There are designs for every age group and many can be wore by all. I found a number of pieces that I would like and my friends daughter likes the same ones. Take a look at all the exquisite jewelry on LESEBI.com. I know there will be something you like. Follow LESEBI on Twitter so you can see when something new is introduced so you can be the first to buy it!